Babywearing is useful during all seasons, but there are many added perks to wearing during the chaos that is the holiday season. 1) Travel: Airports during the holiday season tend to be even more busy and stressful than normal. The convenience of being able to put your infant in an SSC or reign in a running toddler in a quick ring sling can’t be overstated. Babywearing frees up your hands to carry your bags, produce the requested documents, and take off your shoes and belt through security. You can wear your baby through airport security, though additional screening is sometimes requested. 2) Don’t want to play “pass the baby” with your infant? Put them in a front wrap cross carry and all eyes, but not hands, will be on baby. 3) Want to dig into your mashed potatoes but baby wants to be held? A hip carry in a ring sling or wrap can free up your hands to eat that delicious food. Just use caution when around extremely hot food or drinks, grabby hands can move fast! 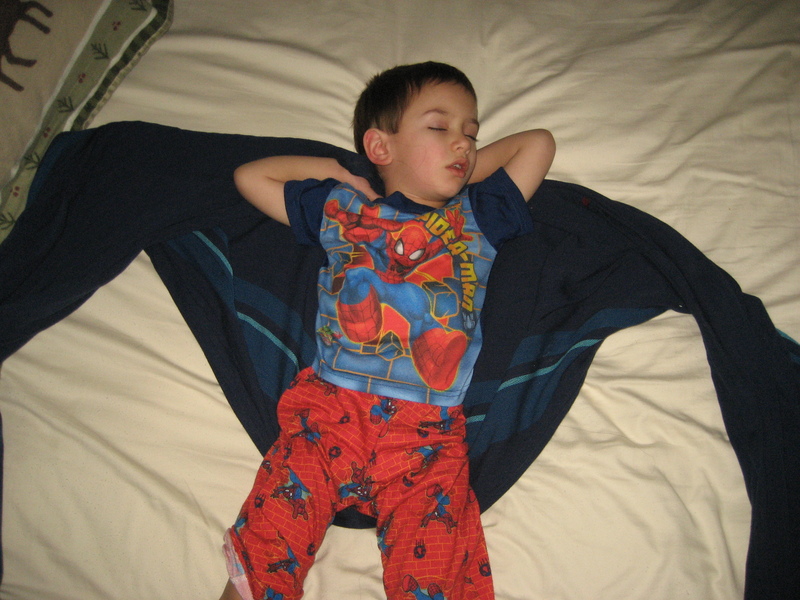 4) Toddler over stimulated by all of the lights, sounds, or activity? Babywearing can provide comfort and a place to hide out from all of the chaos around them. Snuggling next to a caregiver allows them to take a break for a few minutes and calm down a bit which can help avoid a major meltdown! 5) If you are a breastfeeding mama, Babywearing can provide a more discrete way to nurse in situations that aren’t always comfortable. I practiced in front of a mirror several times to see how much you could actually see (not much! ), and that gave me the confidence to try in front of others. 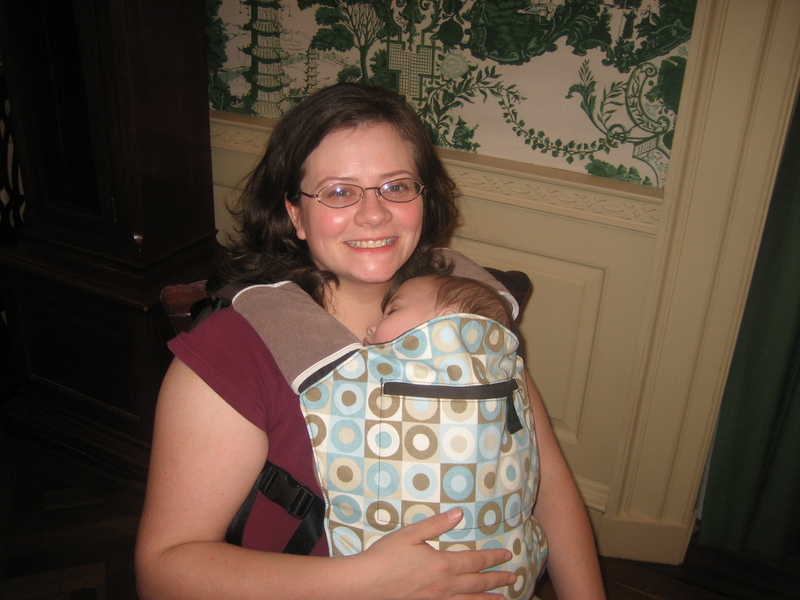 Formula feeding mamas can also use Babywearing as a tool to get a busy baby to calm down long enough to take a bottle! 6) Babies are busy and new places are stimulating; wrap naps can be so helpful in avoiding an overtired baby or toddler who won’t sleep in an unfamiliar place. 7) Babywearing is also helpful for that last minute shopping we all end up doing! There is nothing more stressful than pushing a stroller through crowded stores and trying to keep baby happy long enough to make purchases. Babywearing frees up space and keeps baby close enough to avoid some of the overstimulation that comes with holiday shopping. Whatever holiday you observe, this is a busy time for all of us. 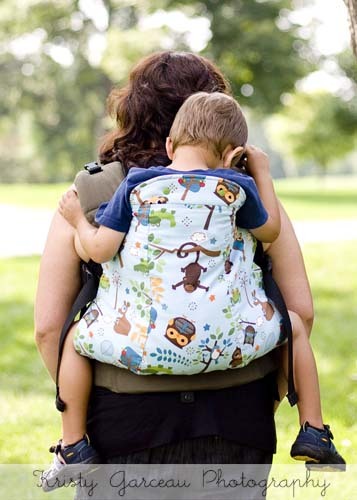 Utilizing Babywearing can help make this chaotic time just a bit more enjoyable and allow you a few moments with your child amidst all of the hustle and bustle around us. From our family at BWI Chicagoland to yours, we wish you a happy holiday season and a wonderful new year! Happy Babywearing! It means bonding. My husband could bond with our boys through wearing them. Whether it was the Baby Bjorn early on or the ergo sport later, he has been able to also care for them the way they’re accustomed to being comforted with me during the weekday. It means protection. People seem less likely to want to put their dirty hands all over your newborn when they’re wrapped up tightly to your body. Little kids reach for feet, not baby faces. And it means comforting them when they’re sick (and fall asleep on your back in a wrap… and let you get them in bed still asleep!!). It means freedom. It means vacation. Hiking and camping in tents. Exposing our kids to nature. In bear country in the Rocky Mountains. And the Smoky Mountains. Even though we call Illinois our home. It means we can take the train downtown and not HAVE to lug a stroller around. Don’t get me wrong, I have strollers. I’ve been thankful to occasionally use the jogging stroller to exercise- though it’s not a very pretty or fast sight. I’ve been thankful for their storage when Christmas shopping. It just means I have an OPTION. It means I could be a more “lazy” mom. Babies who are worn cry significantly less than babies who aren’t worn in those early days, and also beyond. Babies cry for all sorts of reasons. Sickness, overstimulation, health problems, missing naps, the reasons can be endless. I’m all for making my life easier. And opportunity to feel less stressed? I’ll take it! And being part of this BWI organization means I can help other caregivers. It’s really a “caregiver to caregiver” organization. It doesn’t mean I have to know EVERYTHING about babywearing or know EVERY single fabric, length, or fiber of carriers out there (and believe me I don’t). It also means I can defer to others who have more experience or knowledge of other specific carriers or carries. It means I can take what I’ve learned from other caregivers, and share that knowledge with other caregivers. This can be a foster mom who just wants ONE carrier to help juggle her day, a nanny who’s passionate about caring for her littles and wants a few options, or even a dear friend who wants 20 to play with them all. The important question is: WHAT WORLD OF POSSIBILITIES HAS BABYWEARING OPENED FOR YOU? We’d love to hear your stories! And don’t forget to send me your photos for the contest by Sunday evening to hlmagrow@gmail.com. Sunday evening we’ll also be letting you know what special raffles and giveaways we will have over next week. Stay tuned for some items that could be coming your way! ADDING INFORMATION…PLEASE NOTE: THE PHOTO CONTEST, SPONSOR, RAFFLE, AND GIVEAWAY INFORMATION WILL WILL BE POSTED MONDAY OR EARLY TUESDAY. 🙂 SORRY FOR THE DELAY!